You are currently browsing articles tagged airport to city shuttle. Update: Les Cars Air France is now known as “Le Bus Direct”. Instead of taking the RER or train heading into Paris, there is an airport shuttle from Charles de Gaulle or Orly Airport to the heart of Paris. Air France offers a shuttle service for non-passengers (and passengers alike) with central destinations such as Gare Montparnasse, Gare de Lyon, Invalides metro station and Charles de Gaulle Etoile metro station. Considering that this option is substantially cheaper than hiring a taxi, it’s a great deal for a lot less stress. There are four pickup points (Terminal 1, Terminal 2A/2C, Terminal 2B/2D, Terminal 2E/2F) for the three different shuttles. If you’re flight arrives in Terminal 3, take the free CDGVAL shuttle to Terminal 2. Lines 2 and 4 will take you into the city of Paris while line 1 will connect you to the Orly airport. There are two pickup points, one located in Orly Ouest (ie. west) and Orly Sud (ie. south). Line 1 and 3 are offered at this airport. 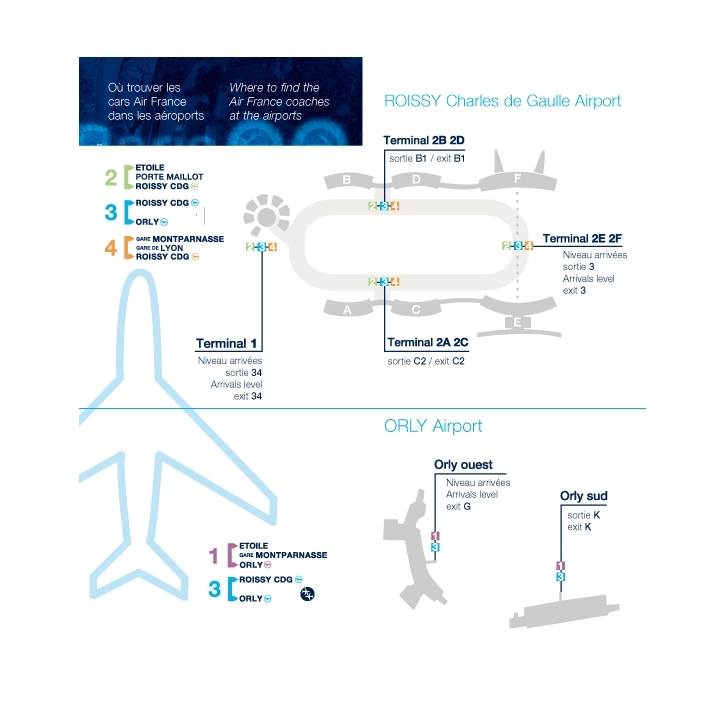 Only line 1 will take you into the city of Paris while line 3 is a shuttle to connect to (Roissy) Charles de Gaulle Airport. Update: Visit Le Bus Direct for the latest shuttle bus prices between Orly Airport or CDG Airport and Paris. Cost will be dependent on what shuttle you take and whether you qualify for any discounted rates. Children from the ages of 2 to 11 get a 50% reduction in fare and groups of 4 or more get a 15% reduction in fare. Prices below are valid from January 1, 2015.